Power. Magic. LIFE. Coursing through your mind, heart, and soul. Mages might wield mighty power, but that comes at a price, and it is not always easy. It takes great control, both of the mind and the will. In our world and the universe of Sarah Prineas' The Magic Thief, mages use aids to focus their concentration and power. That was one of the reasons our universes blended so well. 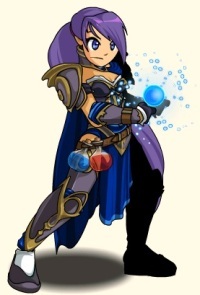 Each mage in AQWorlds has a focus, usually made of stone*. These stones allow the mage to hook into the ley lines and nexuses of magic which transverse the planet, and can guide them to the lines and reservoirs of magic across the world. With practice and a stone for which they feel an affinity, a mage may also use the focus stone to enhance, to boost, their power. The crystalline structure of many stones allows it to hold the focused power mages channel through them. As an example, think of a small tendril of a mage's power being funneled into a gemstone. That small jot of power bounces off the facets inside of the stone, gaining energy as it rebounds off the planes. That extra energy boosts power, increasing the strength of the magical working. With the proper focus and will, a mage may find their strength greatly enhanced, the power of their spells increased manyfold. Of course, that is for normal mages. With the... unique... magic found in Cysero and Warlic, who knows? These two rare mages have not allowed a proper study of themselves to be made. 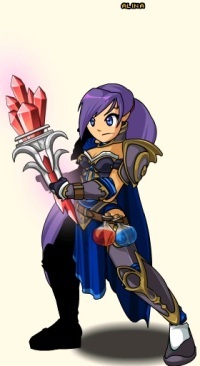 * For example: Cysero with his stone hammer, Warlic with his gemmed staff, Alina with the stones she uses in her potions. 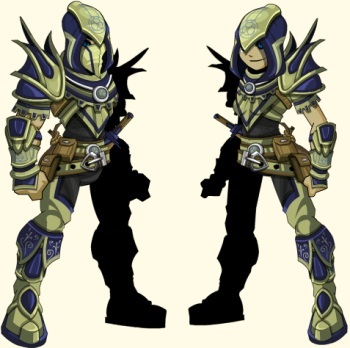 This Friday set your sites on a store full of mystical, magical, awesome armors, accessories, and weapons! 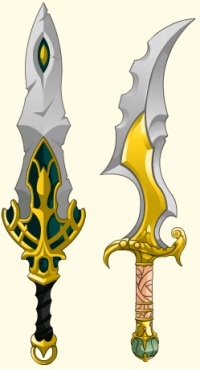 From the enticing member-only Embero Spell armors as quest rewards to the powerful Aether Blade in the AC Rares shop, all the way to the Obsidian Athame free players will find dropping from Deorysa, there are rewards for everyone to collect and covet! 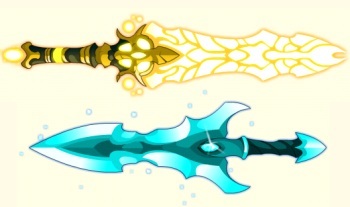 Mystical Blades in the AC Rares shop! Dage the Evil's Death-day Shop Leaves Friday! Dage returns to the Underworld tomorrow, taking his shop of rare birthday (birthweeks?) items with him! They will NEVER be available again, and that's one of the reasons the shop stayed so long. If you haven't battled your blade-edge off farming for the Paragon pet, get your armor in gear and get moving! The Magic Thief event will be available for the foreseeable future, but the event rares will leave after a week, so get this massively-magical gear while the shop's still in-game! And be sure to check out The Magic Thief event page here!